You want some pixels but don't have a website? Many of the advertisers on The MillionDollarHomepage are actually affiliates. That's a ClickBank affiliate of the RichJerk program. 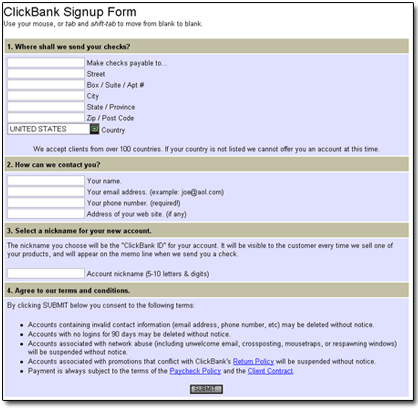 You can sign up with ClickBank now in under 5 minutes. ClickBank already have over 100,000 affiliates earning sales commissions from 1% to 75% on the sale of digital products. Sign up for free and start earning commissions today. You can see the ClickBank sign up page below and how easy and fast it is to complete. This is an example of an affiliate code for TheRichJerk.com program. We won't make a secret of it: the actual url is an affiliate code of Bob's provided by ClickBank. If you click it and go on to buy the product Bob gets $22.00! You can sign up and do exactly the same in under 5 minutes! The RichJerk programme is one of the most successful on the ClickBank network paying 50% commission on all affiliate sales. This will earn you $22.00 per sale (correct at print). Bob's Maths: Spend $10.00 on a 90 day pixel block + link to RichJerk program + 1 Sale = $12 profit! Bob suggests that you check out ALL the affiliate sale possibilities on the ClickBank network - look for the 'Gravity' rating - this indicates the 'strength' and thus possible earning conversions from each program. The higher the gravity, the higher the chances of you making sales. Anyone clicking your ClickBank link is tracked and any sales made are commission payable to you! So you can sign up with ClickBank - buy some space here and start generating sales. See below - just fill in those fields and you're up and running. And remember Bob's Maths: Spend $10.00 on a 90 day pixel block + link to RichJerk program + 1 Sale = $12 profit. See below how quick and easy the form is! Even Nick could do it. Simply sign up - select the programme(s) you would like to promote - you can then buy the 10% pixels here and direct traffic through your new ClickBank urls! Bob is so cool. Click Here to sign up with ClickBank now. Then vote and order 10% pixels. Bob is not claiming that you are guranteed to earn money from affiliate programs such as ClickBank. He is simply offering tips on how you can bebnefit from such programs.